The Pitch: The Lost Middle-Aged Men. The Review: In film and literature, the supernatural is often accompanied by a sense of the theatrical, almost the over-dramatic. From the classic vampire tales to modern day films such as Interview With The Vampire, the idea of creatures who are forcibly stuck in perpetual darkness and who tend to dress predominantly in capes, ruffs and frills make their lifestyle seem larger than life, and the operatic tendencies of earlier film makers – especially in the way that vampires are often seen claiming their victims – help to reinforce their sense of otherworldliness. Which is all well and good, but surely vampires have to go shopping at some point? Even they must have a routine? And what would it be like being cooped up with the same three flatmates for hundreds of years? 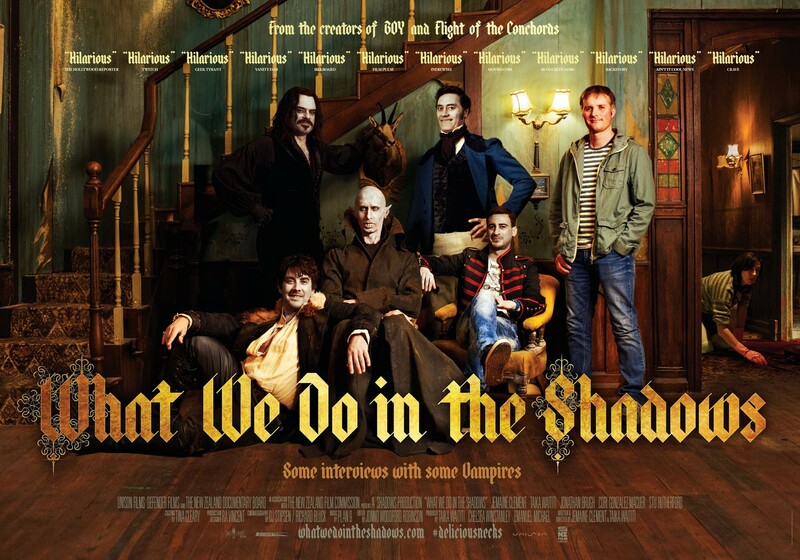 What We Do In The Shadows is a horror comedy that has a vague stab at answering some of these questions in the style of a faux documentary; rather than a vampiric Blair Witch, this sits more comfortably in the same genre as The Office, but with much more neck biting and general debauchery. That rambling, shambling decadence of pointed toothiness comes in three main varieties. Taika Waititi is Viago, the dandy who still manages to amuse himself with sight gags involving his lack of a reflection; Jermaine Clement is the elder statesmen of the group Vladislav who just also happens to be a massive pervert; and Jonathan Brugh is Deacon, the relative youngster of the trio at around 180 years old, who deludes himself into thinking his vampire shabbiness is the epitome of cool. There is technically a fourth member of the house, the 8,000 year old Petyr who lives in a tomb in the basement and who’s gone full Nosferatu while he eats chickens noisily. A documentary crew follows them around during their night time cruising of Wellington, New Zealand, and their interactions with a local pack of werewolves headed up by Rhys Derby. The documentary crew follows their misadventures in the run-up to local costume ball The Unholy Masquerade, including newly turning vampire Nick (Cori Gonzalez-Macuer), Deacon’s difficulties with his human familiar Jackie (Jackie Van Beek) and Viago’s pining for his now elderly human former love. There might be a good reason why vampires should remain in the shadows, for hundreds of years of undeath still haven’t given them the opportunity to sufficiently hone their social skills, and they bicker with each other and fall out with almost everyone they meet. It’s hard not to warm to them, though, thanks to Waititi’s goofy charm, Clement’s egotistical swagger and even the narcissism that Brugh brings to Deacon doesn’t unbalance the group. It’s a chance for everyone to do silly Transylvanian accents while talking about vacuuming and doing the dishes, and to puncture some of the pomposity that’s inherent in the genre in the process. These vampires might be domesticated but after several centuries they’re still barely housebroken, and that leads to a steady stream of chuckles as they try desperately to keep each other out of trouble. Sadly, what it lacks above the chuckles is any real belly laughs to elevate it to greatness. It has fun with the conventions of the genre, it’s often inventive with its effects and it’s not afraid of more than a little blood gushing everywhere (no wonder that the first name on the “Thanks” roll in the credits is that of famous Wellington horror director Peter Jackson), showing once more what you can do with a small budget if you’re creative. It also knows its source material and the rich heritage of vampire films well, but it doesn’t always do much more with the conventions than other, more serious vampire films have done; take Interview With The Vampire, and Brad Pitt’s watching sunrises in cinemas. The same idea is at play here in places, but writers and directors Waititi and Clement, both creative veterans (along with Darby and others) of Flight Of The Conchords, end up setting for gentle fun rather than any significant skewerings of the vampire myth. It’s at its best either in the small observational moments, or in the grandstanding finale when it truly lets rip. What We Do In The Shadows is fun while it lasts, and you might still have Plan 9’s jaunty mid-European score in your head for a while later, but won’t have the same kind of long term endurance as its characters. Why see it in the cinema: I can’t help but feel I may have been slightly harsh, but often your own enjoyment of a comedy is a reflection of the audience you see it with. This film is getting UK screening requests through OurScreen, and hopefully if you attend one of those your fellow audience will be more up for it than mine was. More on this in a moment. What about the rating? Rated 15 for strong language and bloody violence. Yes, even the claim from the trailer that they’re “werewolves, not swearwolves” can’t stop this from getting a mid-teenage rating. My cinema experience: As this wasn’t showing in my normal areas of Cambridge or Bury St. Edmunds, and I was in the area (i.e. I was half an hour away), I made the trip to Cineworld Stevenage to see this. I’m not sure it necessarily played to the right audience; only about half full anyway, about ten minutes in, someone two rows back from me turned to the person next to him and said, without any trace of irony, “Is he a vampire?” (You might be able to gauge how ridiculous that is if you can still watch the first six minutes here.) I did get some extraordinarily cheap petrol at the petrol station on the way home, so there were upsides to the trip, they just weren’t all in the cinema. This entry was posted in Reviews and tagged 2014, film, Jermaine Clement, mockumentary, movies, review, Taika Waititi, vampires, What We Do In The Shadows.